You know, there is something about a task, a big repetitive task that is just MORE FUN when you add a power tool! 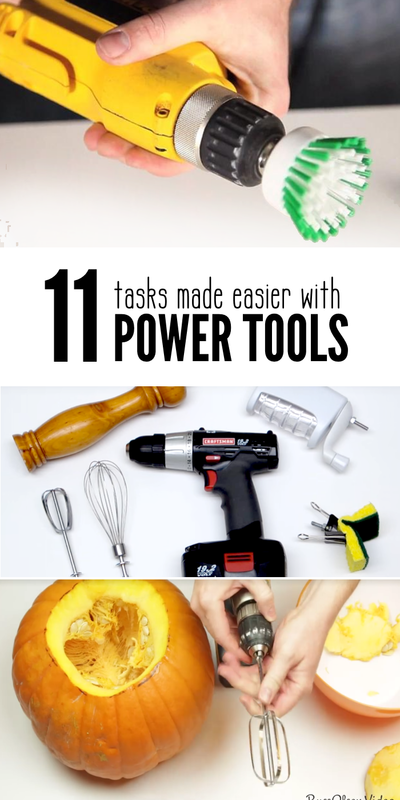 These unusual uses for cordless power drills will inspire you to be more efficient and have fun with some of your daunting tasks, whether it is scrubbing grout or peeling a hundred apples, power tools are amazing. Who wants to tear up their nails and get an aching elbow? I am guessing you aren’t jumping at the chance to scrub the grout by hand! And that is why my grout looks as dingy as it does!! But no more! Here is how you can attach a scrub brush to your drill and get sparkly grout in seconds. Making apple pie or homemade applesauce?? Do you have a bunch of apples to peel? 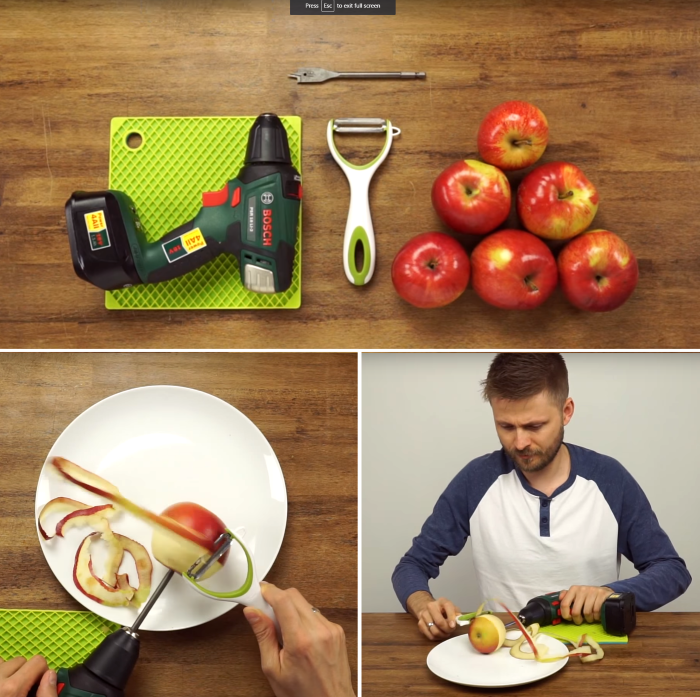 You will be shocked at how fast and easy it is to peel apples with the help of your nifty power drill. You can peel SO many apples in the time it would have taken you to peel just one by hand. Pencils! I don’t know if you have been following our blog for long, but we have six kids. Of course the pencil sharpener is going to break the night before school starts, and of course, I have 47 pencils that need to be sharpened as the kids begin the year. Power tools to the rescue! Want to grind a bunch of pepper? Or nutmeg? Grab your drill! Got a gross pan that needs a powerful scrubbing? Get an old large binder clip, drill a hole into the back of it and then you can use that to fit your drill attachment to the binder. Clip your scrub pad to the binder clip and give it a whirl in your pots and pans! Pumpkin guts are gross. Why get your hands dirty when you can just whip them loose and out? 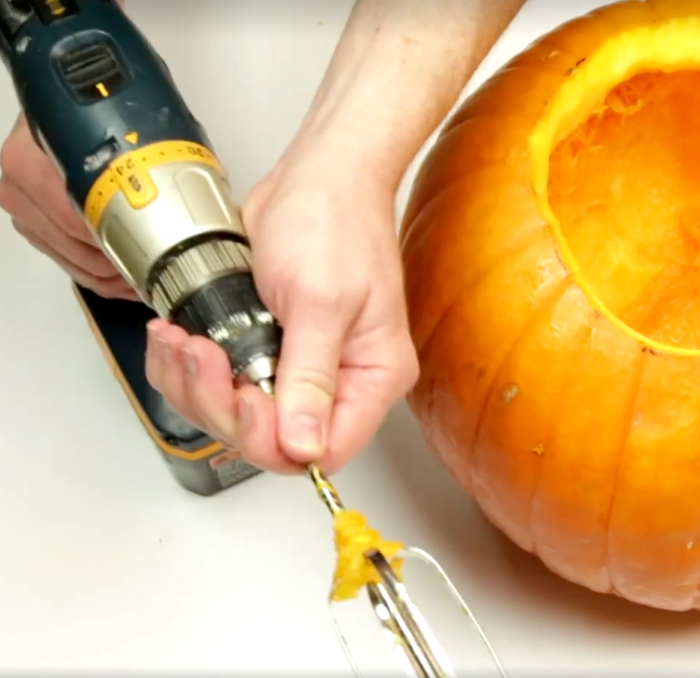 We suggest using a paper plate over your drill to keep the guts contained a touch. Rotisserie chicken is the best! Especially when it is slowly smoked over a bed of coals!! YUM! But just because you don’t have the time to sit there and turn the meat every few minutes, doesn’t mean you can’t enjoy your meal!! 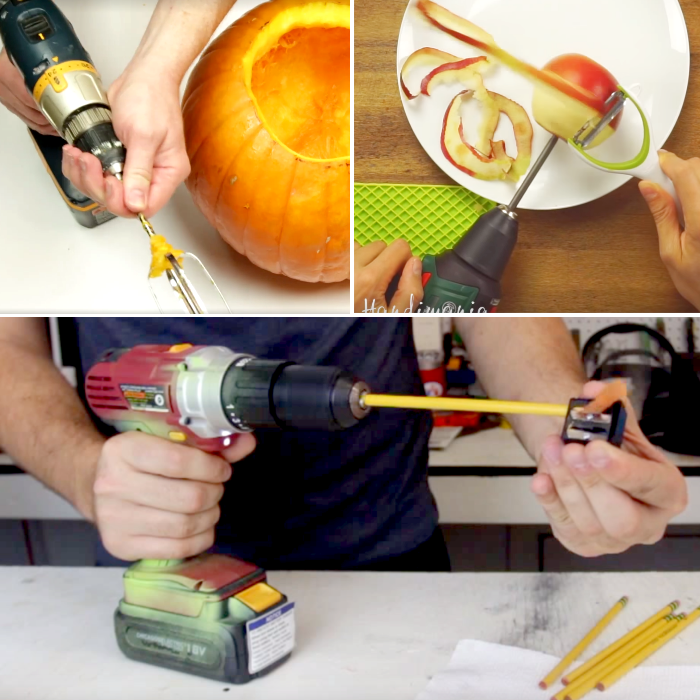 Grab your drill, attach it to the skewer and turn the drill on low. yum. 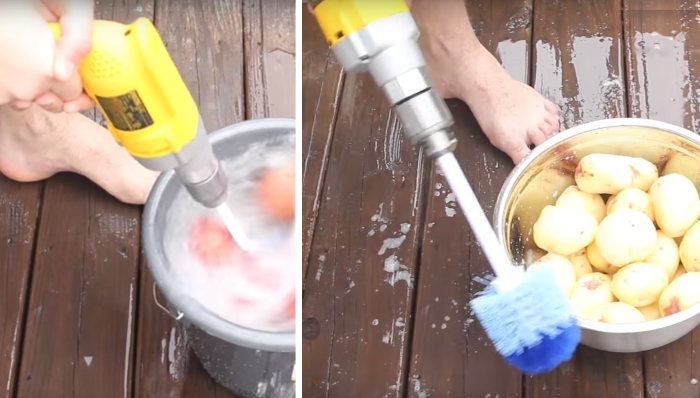 Peel your potatoes in seconds! Really! What did people do before there were power tools? This is a bit messy so we suggest you go outside, but use a dish scrubbing tool (the kind for bottles or cups) and stick it into your drill. Fill a pot with water and your unpeeled potatoes and give them a whirl. Scrub the peels right off those potatoes. After you have your potatoes peeled, boil them in a pot until they are soft and then use your cordless drill to whip them into mashed potatoes. Add some butter, some sour cream and use the whisk attachment from your blender in your drill. Thanksgiving dinner couldn’t be easier! Like to go fishing?? Now you can reel in your catch with your drill! Ha! And here I thought I knew everything that power drills could do. This fella broke his reel and created a makeshift reel from his drill – Genius! Your shower probably wants some TLC to help it sparkle. 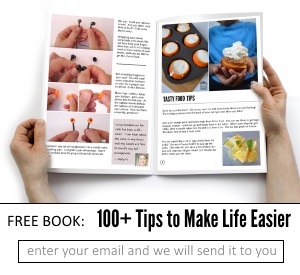 Your power drill can help! Attach that scrub brush to your drill, add a squirt of soap and some baking soda to help break down the grime and give it a whirl over your shower walls, floor, and even doors. Do you have a hand grinder for your coffee? And you want to make a whole pot? 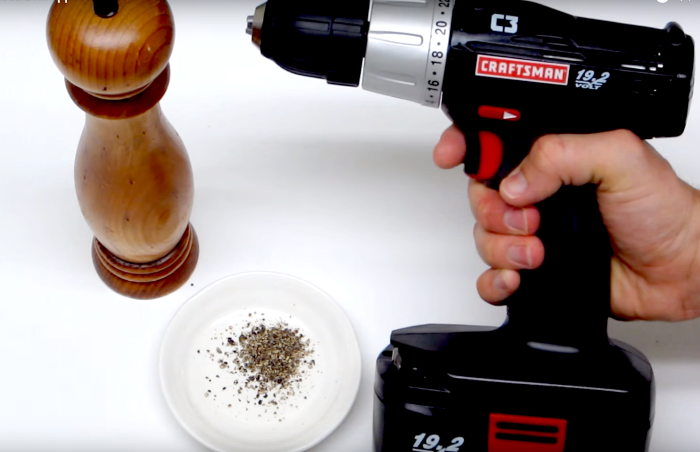 Hook your power drill into the grinder and speed up the process.